Leather and music are an inseparable duo. It’s been that way for decades and there’s no reason to believe it will change any time in the near future. While we’re all thankful that parachute pants went the way of the Dodo, leather is an iconic piece of music’s past, present, and future. Koch Leather is no stranger to the music scene. They’ve been making their guitar straps for the past couple of years and they have been well received. 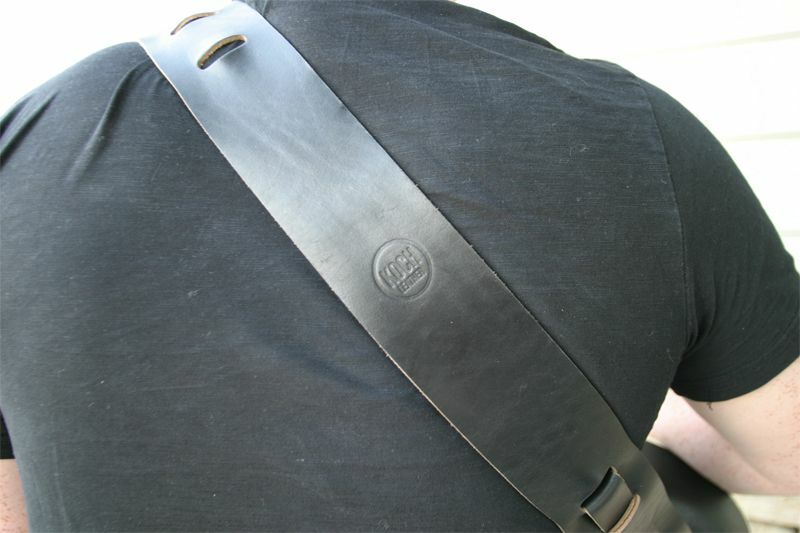 Not only are a few well-known Christian musicians sporting Koch Leather guitar straps – they also worked in collaboration to create a line of straps for Hogjim Guitar Gear. This is the second piece Best Leather has reviewed for Koch Leather, which is owned and operated by Josh and Jen Koch in Pinetop, AZ. They’re just about to wrap up a successful Kickstarter program (congrats!) and we look forward to seeing this talented couple launch into their budding business full time. Black Horween Chromexcel + Koch’s attention to fine detail = one awesome looking, perfectly functioning guitar strap. One of the things I appreciate about Koch Leather’s construction practices is clean lines and attention to detail. It’s evident in all of their products when looking at the way the leather is cut, the seams are sewn, the rivets are placed; it is easy to see they take pride in their workmanship. 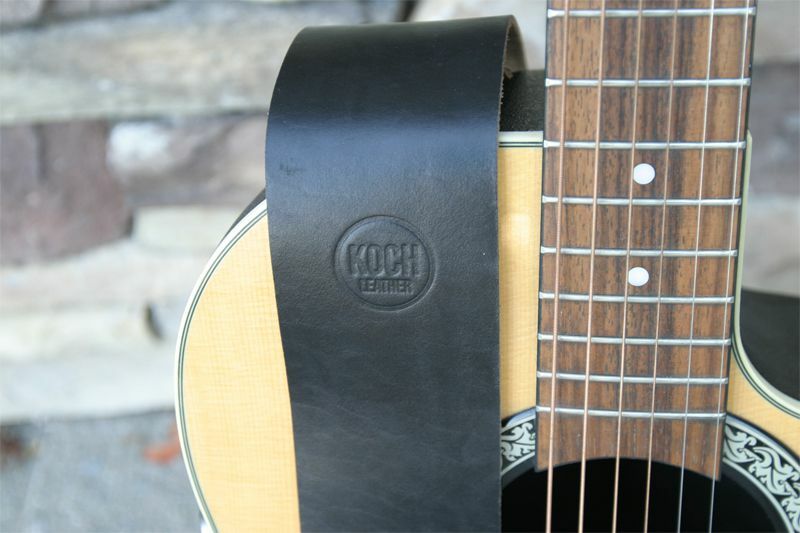 The Koch Leather Guitar Strap does its job well and feels great when you’re strapped into your guitar. The wide mid-section of the strap is comfortable across your neck and shoulder, which allows you to play comfortably while standing or sitting for long periods of time. One thing that’s important to point out about the Koch Leather Guitar Strap is that it features two adjustment points. Many straps of this design usually only have one piece that is adjustable. Having both ends be adjustable allows the strap to be very customized to anyone’s guitar playing style. And, it’s a great feature for guitar players who are tall or who have additional girth in front of them…or those who have both of those situations to contend with. Again…it’s Horween Chromexcel and Koch Leather makes it. Beyond that, the color is spot on for a guitar strap. Black is always “in” – but, if you desire, it can be ordered in two other colors: chestnut or brown. It’s hard to go wrong with a nice, thick strap made of leather when you combine it with the eye pleasing wood tones on an acoustic guitar. If electric guitars are your thing, it will definitely compliment those as well. The finish of Horween’s Chromexcel combined with the clean lines of Koch’s construction combine to create an aesthetically pleasing piece of leather. And, it’s extremely functional to boot. It’s a piece that gets noticed too. Every guitar player has a strap of some sort…so, it’s not something that gets noticed much most of the time. However, several different guys immediately noticed this strap – and they quickly pointed out the dual adjustability feature too. Ditch the conventional, run of the mill straps at the music store and get yourself a quality piece of leather from Josh and Jen. The Koch Leather Guitar Strap is well worth the $60 investment. It’s a piece of equipment that will last as long or longer than your guitar and will age well year after year while giving you the ability to comfortably play your guitar from any position. **Act quickly and you can get in on the tail end of Koch Leather’s Kickstarter, which ends on August 17th. If they hit their stretch goal, there may be an additional color available for the guitar strap and their other products. So go support their Kickstarter – inquiring minds want to know what that other color is going to be! 5 Comments on "Koch Leather Guitar Strap – $60"